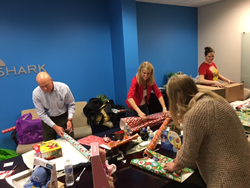 ClearShark, a small IT sales company based in Hanover, Maryland, participated in the 2015 Soldiers' Angels Adopt-A-Family program. Despite the small size of this company, they decided to give back to military families in a BIG way-- the company adopted 37 families this year! Collectively they purchased gifts for 109 children and their parents as well as providing each family with a holiday meal. Twenty-five ClearShark employees and management volunteered to shop for these families, coordinate a holiday meal, wrap presents and deliver/ship the gifts. A huge Thank You to everyone at ClearShark for all you did to make the holidays special for these deserving families! To read the full story, click here to view the press release from ClearShark.